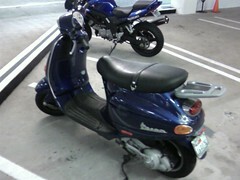 Behold, my noble steed, the mighty Bluesephalus! It is indeed nephandi's old Vespa, which he will have no need of in the frozen wastelands of North East America. Therefore, I have taken it from him, and since he didn't accept my offer of a whole slew of CCG cards, and my cat, I had to give him money. It's quite useful in Venice, as I can park it in the front area of my apartment building and not have to wander all about looking for a parking spot. I can not tell you what a blessing that is! It's also fun to ride, and I am thinking that I am going to be the world's first xTremE! Vespa stunt-rider. I wonder how far I could jump her? Arriving at trekker315's house last night for Nerd Night, I commented to he and daogre that I had become a stereotype, I had just stopped at Whole Foods on my Vespa to pick up some organic vegetables for dinner. I'll try not to have such stereotypical moments in the future, probably by getting one of those totally rad skull helmets to wear. That'd be bitchin' Particularly if they had them in a matching blue! You didn't really contemplate to give your cat away, did you? For some reason I am stuck with that line. I should focus on moving to Scotland instead. You're kidding, right? No, I didn't really intend to give my cat away. At least, not for a scooter. Of course I am. But maybe I'm peculiar right now (or always;)) since I have to give mine away for a move to Scotland. wow... the more i read, the more jealous i get. first Vespa envy, and now Scotland envy! ever since visiting a couple years ago (primarily glasgow, skye, inverness, and lewis/harris) i've wanted to run away to scotland. I'm jealous. I have always wanted a Vespa. Just, you know, I've always wanted it in Italy. And you must never tell your cat you even joked about trading her in! I threaten to give her to the gypsies all the time. Particularly when, like today, she sits on my head at 5AM and meows until I wake up. I should add that the area under the seat is a helmet box, which I call "the pumpkin hatch" because it looks about exactly the right size to put a pumpkin in. It is clearly marked, "No pets!" The cat is simply devastated. The best storage you'll get from it is if you steal/buy a milkcrate and attach it to the back thingie behind the seat with bungie cords. Between the milkcrate and the under the seat trunk I'm able to make a pretty good grocery run. Also, make sure you own light colored sunglasses (if you have a half helmet like I do.) There is nothing stupider than getting stuck somewhere after dark and not being able to see as you ride home. It is the choice between forgoing sunglasses and thus squinting so tightly that you can't see or wearing sunglasses that are so dark you can't see. It is very exhilarating. Well, i do still have a car for groceries, so that's not so much an issue. Mostly this is getting around locally, and to and from work. However, precisely the situation you describe happened last night, i was wearing a full helmet - and when I came down off the Sepulveda Pass, the 40f or so temperatures in the valley warmed right up to a much more pleasant 50-ish. However, this brought with it thick fog - and my visor immediately fogged over. I flipped the visor up... and my glasses fogged up promptly, too! It was alarming. Fortunately it was late at night and there was relatively little traffic. Though the milk-crate idea is a good one! 5AM? That's not right. It's just not right. Currently, btw, Simba hates me. He had his surgery yesterday (so he also hates Dr. H, the vet office staff and everyone associated with the building in which the office resides). So today I had to rinse out his mouth with the oral wash, squirt antibiotics down his throat and apply pain killer to his gums. I am dead to him. Allegedly my cat needs to get her teeth cleaned, too - and I am reluctant to do it because of the expense, and because of what a pill she is. Hey- cleaning is a lot cheaper than having teeth pulled (and assorted other, related things while they were in there)! That was nearly $1,000.00! you are familiar with the story of motorcat, right? ...now i have Vespa envy. the whole time i lived in baltimore i kicked around the idea of getting a scooter, but never really had the cash for it. she is quite the pretty machine. congrats! I wonder how hard it would be to airbrush (or powdercoat?) that blue? I suppose if you were diligent about taping and had a steady hand, you could spray paint it yourself...? Actually... can you wear goggles with that thing? Hard to tell if there are lenses built into the face plate. there are lenses built in. And you get one smoked pair, and one clear pair. Drawback - you can't flip the visor up, if they fog. Which is probably why it's not DOT approved. Is it pronounced Blue-syphilis... cause thats totally how it is getting pronounced in my head. Jealous! I'd love to have a scooter. I'd paint mine in ice cream colors: strawberry pink for the body with pistachio, melted chocolate, and vanilla polka dots. And I'd have a helmet to match. I couldn't do that, and still be considered straight. Srsly. You need not worry about that Dave :-) Nice scooter.